John Smith, Rhyl PS Secratary has'volunteered' to organise this year's NWPA Battle and I would like to invite your club to take part.. This year the ‘Battle’ is slightly different in that it is to be a ‘print only’ competition. Clubs are invited to enter the competition with just 8 prints each mounted on a 50x40 board. Clubs with less than 20 members can have two pieces of work by one member. Clubs with more than 20, then it is one print per member. I know that some clubs are non-competitive but if so, please will you consider entering - even if it is just this once! Then, importantly, maybe have a club outing and come along on the day, meet the members of the other clubs taking part and enjoy seeing the entries and hearing the judge’s comments. Whilst I will need a list of the titles and a photograph of each print for showing to the audience, the actual prints can be brought in on the day so there is no postage or expense involved. 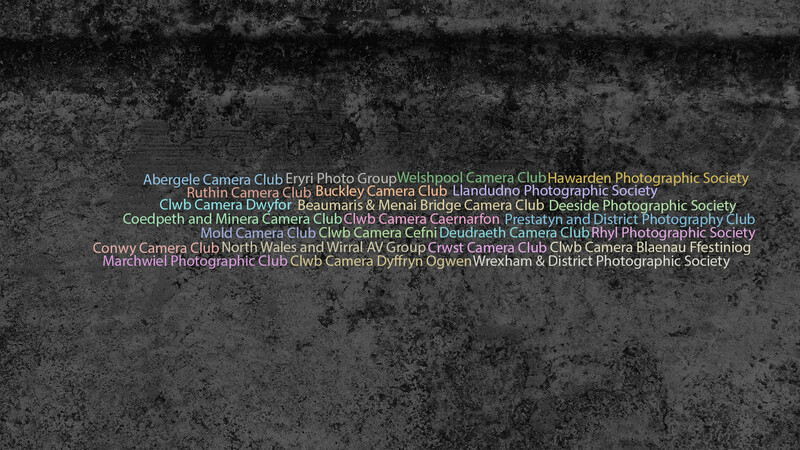 It really is an enjoyable social occasion meeting up with like-minded photographers from all over North Wales. Initially, can you please let me know if your club is willing or not to take part so that I can get an idea of numbers? A telephoned/e-mailed request is acceptable, but a written confirmation should be sent within 3 weeks. This confirmation should be used to establish anticipated expenses. No fee is payable for judging. This should also establish what equipment a lecturer might require. A reminder should be sent no less than 2 weeks prior to the visit, which should include clear directions, postcode, parking information & emergency telephone number. If the judge is to receive work beforehand, ensure that suitable arrangements are made for delivery. The club’s programme should show the relevant qualifications/distinctions. The judge/lecturer is your guest and should be accorded good hospitality. If they are travelling some distance, a meal beforehand and/or overnight accommodation should be offered. A drink before starting is welcome. Ensure that someone welcomes the visitor who will probably arrive half-an-hour before the event starts. Ensure that all equipment is ready. Try to start on time, keeping notices to a minimum. The visitor may have a long drive home afterwards. These will have been agreed beforehand and must be re-imbursed on the night. Cash is often preferred. Judging and lecturing take a lot of preparation and standing talking all evening is hard work. Awards for Photographic Merit in Audio Visual adjudication taking place at Wilmslow on the 18th and 19th May with the possibility of an Advisory Day or evening session. If you wish to apply for the award – then you need to contact Phil Chadwick, the APM Awards Officer as soon as possible. The 2019 Welsh Salon is now open to receive entries with a closing date of 3 March. there are numerous prizes and awards. offer. (A list of all the awards from last year’s salon can be seen here). You can find the new conditions of entry on the website: www.thewpf.co.uk. Please read them carefully. Please note, there are new file sizes for digital entries and for digital versions of your prints. Vince Penticost, Mike Cullis and Paul Keene. Detail of the exhibition dates and venue will follow in due course. Can we do better this year? for entries until 18th February 2019. Judging takes place on Monday 18th March at Bridgend’s usual venue and all are welcome. Pixels 2019 - A date for your diaries….. The next Pixels competition will take place on Saturday 2nd November, 2019. Closing date – 26 January 2019.
and Ribbons to be won + FIAP Blue Badge for Best Entrant. Low entry Fees. Generous discounts for club/group entries. A4 Full Colour Printed Catalogue sent to each entrant. The weekend includes some social time to meet your friends or make new ones with the wonderful photographic hobby. As you know the Awards are becoming more and more popular and the Credit category for the November 2019 Adjudication is almost full. In order to try to keep up with demand and, to ensure that an entrant does not have to wait more than a year to have their application assessed, I am writing to all the Credit entrants for the November 2019 Adjudication to enquire whether they would be interested in their application being brought forward to a “closed” Adjudication, possibly in September 2019, if they are not planning to attend the event in Watford. I have given a deadline of 15 February for their response and, as soon as the numbers are known, a decision will be made whether or not to run the “closed” event. The PAGB’s GB Cups were judged recently and North Wales results are: Dwyfor bravely entered the Open section and finished =60 out of a total of 68 clubs, having scored 150. The Small Clubs section was won by Mold with 120 points and Conwy finished =13 with 105 points out of an entry of 56 clubs. Many congratulations to all involved, but why did only three NWPA clubs enter? Ian O’Neill has spent many, many, many hours building this for us. You will find all sorts of information and links to other sites. Most importantly, you will find lots of photographs. After all, this is what we are about. Ian is compiling galleries of pictures from members who have gained distinctions. Please have a look at these and send your images to Ian if you are able to add to these and give the year of your success. A timely reminder that the online entry will be able to be used from March 1st, and we hope for an excellent year! There will be six sections. Two will be prints, mounted on 50cmX40cm card ONLY. One section will be open colour, the other open mono. The best of these will be able to be displayed in Venue Cymru during July. The other four sections will be PDI's: open colour, open mono, scapes and nature, the rules of which can be seen on the website. Four images can be entered for each section, so 24 images can be entered for just £12. There are awards for best images and for each of the judges’ choices for each section, there will be a ribbon; also there will be Honourable Mentions. We believe that there might be young members who would like to enter. We would love to welcome you and wish you well in your quest for an acceptance. Whilst we haven't got a specific section just for juniors, please let us know if you were successful, then we can publicise it. The online entry will continue until April 5 and the prints can be taken to the NWPA battle the following day, or dropped off at my house in Rhos on Sea by arrangement before that date. Tel no 01492 525919. All that remains is to wish everyone good luck. Hopefully, you have all had a good look at our newly designed website. and give the year of your achievement. If sending your images to Ian can resize them to 1000px on the long side, please. All these members are now entitled to put Hon.NWPA after their names. An Image by a Photographer, or an Image so similar as to be nearly identical, may only be entered into one of the Categories, and is not eligible if it has been entered previously to any Inter- Federation Competition. Each Print may be of any size, but must be mounted on lightweight board(s) of size 500x400mm. The tolerance on mount size is +/-2mm, and the mount must not exceed 4mm thickness. At the Chairman’s discretion, Prints outside the specification may be judged but cannot win an Award or be selected for the Exhibition. The mount must not carry any fixings or other material likely to damage Prints when stacked. Image files must be in RGB mode (even for monochrome images) and in the sRGB colour space. Files must be saved in JPEG format: saving at not less than quality 10 (80%) is sufficient. The maximum image dimensions are 1600 pixels horizontal by 1200 pixels vertical. Images file with larger pixel dimensions than these limits, and any Image file larger than 2MB, will not upload. A black and white work fitting from the very dark grey (black) to the very clear grey (white) is a monochrome work with the various shades of grey. A black and white work toned entirely in a single colour will remain a monochrome work able to stand in the black and white category; such a work can be reproduced in black and white in the catalogue of a salon Revised February 2018 under FIAP Patronage. On the other hand a black and white work modified by a partial toning or by the addition of one colour becomes a colour work (polychrome) to stand in the colour category; such a work requires colour reproduction in the catalogue of a salon under FIAP Patronage. Note that images already meeting the separate FIAP Definition of Nature will satisfy this less restrictive definition. Nature photography is restricted to the use of the photographic process to depict all branches of natural history, except anthropology and archaeology, in such a fashion that a well-informed person will be able to identify the subject material and certify its honest presentation. The story telling value of a photograph must be weighed more than the pictorial quality while maintaining high technical quality. Scientific bands, scientific tags or radio collars on wild animals are permissible. Photographs of human created hybrid plants, cultivated plants, feral animals, domestic animals, or mounted specimens are ineligible, as is any form of manipulation that alters the truth of the photographic statement. Processing of the captured image, by cropping, exposure adjustment, colour correction, noise minimisation, dodging/burning, HDR, focus stacking and sharpening, is allowed. Cloning of image defects and minor distractions, including overlapping elements, are permitted when these do not distort the truth of the photographic statement. Images entered as Nature can have landscape, geologic formations, weather phenomena, and extant organisms as the primary subject matter. This includes images taken with the subjects in controlled conditions, such as zoos, game farms, botanical gardens, aquariums and any enclosure where the subjects are totally dependent on man for food. Access to biological subjects may be restricted. By entering a PAGB event, Photographers warrant that they have followed relevant codes of practices and hold any necessary licences. Guidance Guidance on implementation and interpretation of the PAGB Definition of Nature is available separately, and may be read in conjunction with this Definition. Wildlife Images entered in Wildlife sections are further defined as one or more extant zoological or botanical organisms free and unrestrained in a natural or adopted habitat. Landscapes, geologic formations, photographs of zoo or game farm animals, or of any extant zoological or botanical species taken under controlled conditions are not eligible in Wildlife sections. Wildlife is not limited to animals, birds and insects. Marine subjects and botanical subjects (including fungi and algae) taken in the wild are suitable wildlife subjects, as are carcasses of extant species. Wildlife images may be entered in Nature sections. There will be six sections. Two will be prints, mounted on 50cmX40cm card ONLY. One section will be open colour, the other open mono. The best of these will be able to be displayed in Venue Cymru during July. the rules of which can be seen on the website. there will be a ribbon; also there will be Honourable Mentions. in Rhos on Sea by arrangement before that date. Tel no 01492 525919. Owing to a glitch in the on-line entry system for our Exhibition, there is to be an extension to the deadline. The system will re-open for Saturday 13 and Sunday 14 April ONLY. This applies to PDI entries. If you want to enter prints, you will have to contact Jean Chadwick (chadwick 284@btinternet.com) and to be prepared to take them to her in Rhos-on-Sea. The new print only Battle was held at Craig-y-Don last Saturday and was judged by David Butler, MFIAP, EFIAP, EPSA, ARPS, Hon.LCPU. Fifteen clubs took part, each entering 8 prints. The winning club was Blaenau Ffestiniog with 142 points, followed by Conwy with 137 and they are both invited to represent the NWPA at the PAGB Inter-Club Print Championship in October. The winning print was “Time” by Sheila McCabe of Beaumaris & MB. Thanks go now to John Smith who masterminded the event, to Pete Carlyon on the projector, Sheila Lewis & her team at Llandudno for the refreshments and George Frost who took the pictures And, of course, to all those who took part. Two more presentations have been made of our new Award. 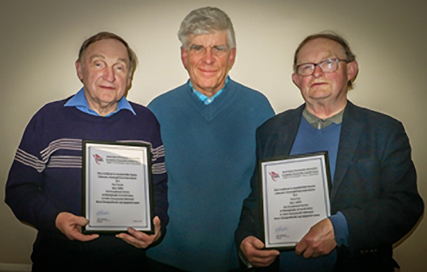 Our President has been to Hawarden to make presentations of framed Certificates to Paul Temple, who has been their Secretary for 40 years and to David Kay, who has been their Treasurer for 40 years. Hurry now to get your entries in for this year’s Exhibition. The closing date is Saturday 6th April to delivery your prints to the Battle at Craig-y-Don, Llandudno And 7th April is the closing date for the online entries Full details on the website. The NWPA would like to invite a few members along to the selection day in the Holy Trinity Church Hall, Penrhyndeudraeth. LL48 6LG. on Saturday 11th May at 10.30 for the selection of the images for the next Sony Inter-Federation competition to be held in June. We would welcome a couple of members to come along and watch how the selection process is carried out. 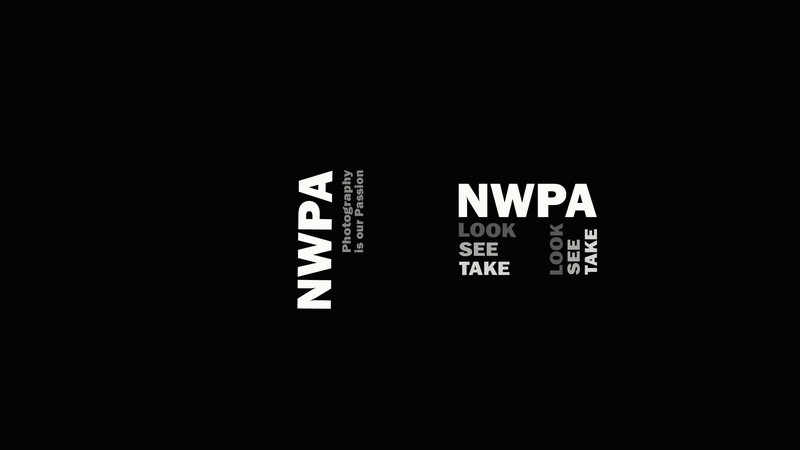 We would especially welcome any member who would be interested in taking over the role of the NWPA Competition S ecretary as Amanda Sims will be standing down later this year. Is any one interested in coming along to watch the process, if so please send Amanda an email amanda.simsva@googlemail.com for further information Refreshments and a light lunch will be provided. John & Linda Bell, Jean & Phil Chadwick, David Evans, Emyr Roberts and Amanda Sims also had acceptances Congratulations to all of them.